A unique solo guitar concert at the prestigious Melbourne Recital Centre will be the platform for the launch of Doug de Vries’ new solo CD on Friday 25 November. Doug de Vries - ranks high at the forefront of international guitarists and is a musician of world class. He is Australia's foremost experienced and versatile jazz guitarist and composer, excelling in many musical genres from jazz and swing to choro, samba and bossa nova, and is a leading exponent of South American music, particularly in the Brazilian guitar repertoire. 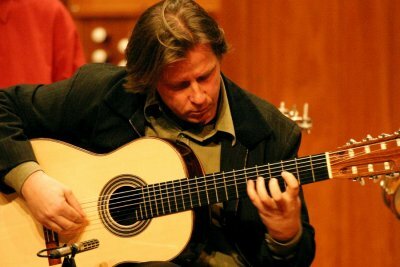 In November 2010 - Doug featured at the Adelaide International Guitar Festival in collaboration with his Brazilian colleague, guitar master Jamandu Costa. In 2012 Doug will perform in Rio de Janeiro in a concert series featuring composers of contemporary choro -The Salon concert will be the Melbourne launch of Doug's new CD 'DdV Solo ' album. Over the years Doug has featured on a number of CDs under his own name, but this is his first solo project CD. 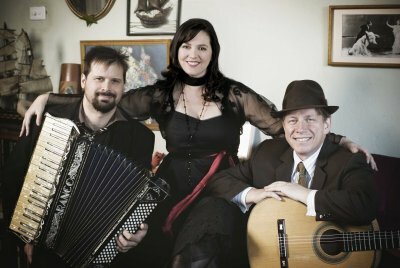 Diana Clark's rich and mellifluous alto voice & songs reflect the cosmopolitan scene of music making in Melbourne and her background growing up in the Northern Territory, while embracing the powerful rhythms of Brazil, the intensity and subtle beauty of Rio. Diana's collaborations with master guitarist Doug de Vries have established her as a persuasive interpreter of Brazilian Popular Song - and the pair have immersed themselves in the traditions of the bossa, samba, and choro revealing an emotive power and sophistication that is given full flight in the company of her sublime accompanists - Doug de Vries, and all round musical virtuoso, accordionist Stephen Grant. DOUG de VRIES - brilliantly ranks high at the forefront of international guitarists and is a jazz musician of world class. He is Australia’s foremost experienced and versatile jazz guitarist and composer, excelling in many musical genres from jazz to choro, samba and bossa nova; styles that form the basis of Brazilian popular music, and he is also considered Australia’s leading exponent of Brazilian guitar repertoire. Doug de Vries is particularly noted for his sophisticated accompaniments, deep knowledge and daring improvisations in jazz and other settings, be it solo guitar or in ensembles. Doug has widely toured and performs solo as well as accompanying vocalists and other instrumentalists internationally. Working in close association with Doug de Vries, Australian singer-songwriter DIANA CLARK has earned her reputation as a persuasive interpreter of Brazilian Jazz. Diana's beguiling, soothing voice brings to life original songs laced with KD Lang's poise and Nina Simone's depth while mixing English with Portuguese over a bed of guitar & piano. “De Vries and Clark feel the music of Brazil down to their bones. His guitar is full of romance and her voice is so intimate it could make you blush. Australia may be halfway around the world from Brazil but you’d never know it from listening to their CDs.” Cadence Magazine USA Sept 2005. “…Buoyed by gently vibrant Afro-Brazilian rhythms, Clark’s warm vocals can soften the melancholy of a yearning lyric, or coax the vibrant rhythms around her into a dance of celebration.” The Age (Melbourne).